It seems that I over did it at PaleoF(x). The box jump leg wound I mentioned a few days ago became badly infected over the weekend. Two late nights and three long days of learning, eating and running around the greatest Paleo Symposium of the year left me exhausted. By Sunday night I was out of it. Then this morning, after starting an antibiotic for my leg, I fainted. I don't remember seeing my son this morning, what I had for breakfast or even how I drove from the doctor to my meeting. By the time I got there, I felt literally upside down. I got totally overheated, started shaking and fell. Since then I've been weak and confused, resting on my big living room couch. Needless to say, I need to take it easy. Tonight, I need something healing. Fortunately for me, I cooked up a HUMONGOUS batch of nutrient-dense bone broth last week and have it at the ready for bad days like this one. I've said it before and I'll say it again: make friends with your farmers. Jeff and Tammy Parnell of Southern Traditions in Austin are my new BFFs. 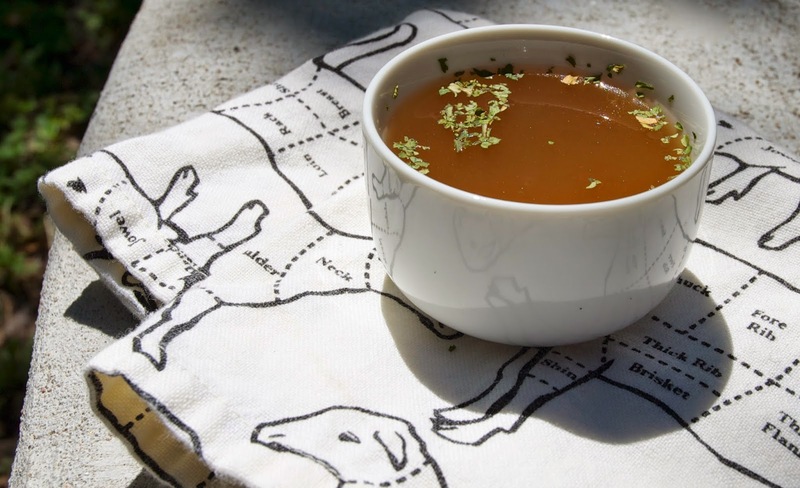 They gave me a big bag of grass-fed beed bones and shared this recipe for their ever-popular super bone broth. I am so excited to be able to share it with you, too! They were at PaleoF(x) this year, offering their Paleo Packages as a CSA on their high-quality meat. Please check them out and tell them I sent you! I am so excited to sign up for my first package with them. I'm also in the market for a produce CSA. I'm so geeked out on real food after spending time with the passionate paleo community this weekend. 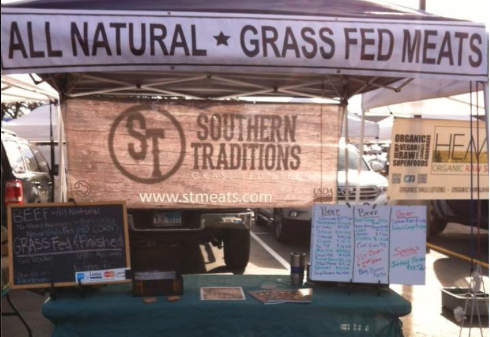 Anyway, if you are in the Austin area, check them out at the SFC Farmers Markets around town, where they sell responsibly sourced meats and Tammy's famous bone broth. Preheat your oven to 350º. Spread bones evenly on a foil-lined sheet pan. Roast in the oven for 30 minutes. 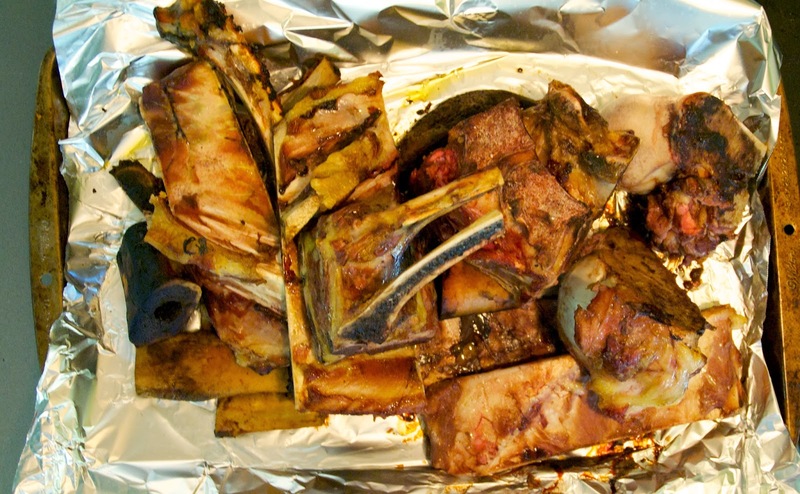 Remove the bones from the oven and add them to a large stockpot. Add water and apple cider vinegar and let rest for 30 more minutes. Add the remaining ingredients to the pot and bring to a rapid boil. Let boil for 15 minutes, then skim the frothy form from the top (these are the impurities, though grass-fed meats have less than conventional meats). Cover and reduce to a simmer. For the first couple of hours, check it every 20 or so minutes and continue to skim. After that, leave on very low heat and continue, slow simmer for, at least, 15 hours up to 24 hours. 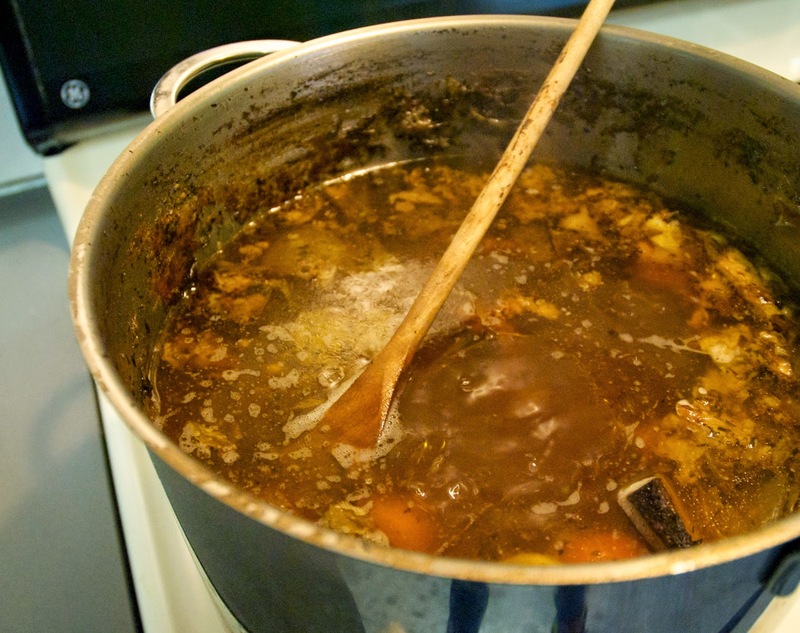 The longer it simmers, the more nutrients are released into the broth. Remove bones and veggies and let your the liquid cool down. When cooled to room temperature, move to the refrigerator. The fat will rise to the top and congeal. Once it has hardened, remove it. You may either discard this or render the fat to cook with. You should have what looks like beef jello under this layer of fat. Drink 8 ounces of this a day for some super heath boosts! Enjoy! Roast the bones for 30 minutes to really bring out the most flavor. Apparently, this stuff is really beneficial for you in all kinds of ways. 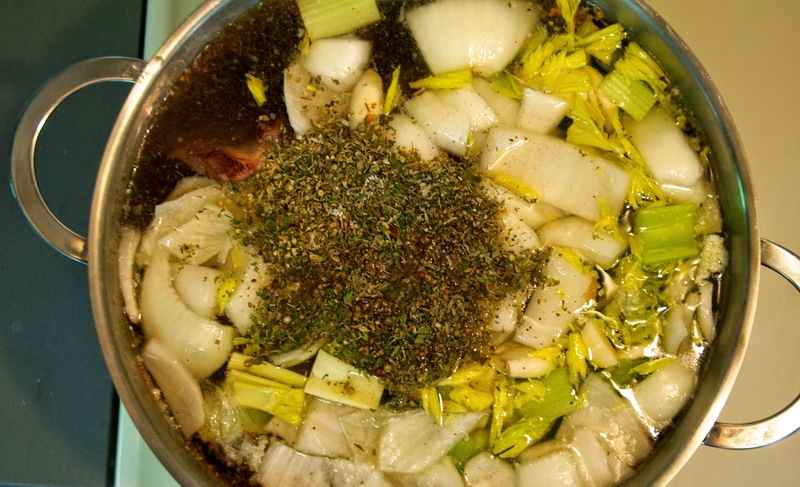 Check out more on the Whole 9 Life FAQ page about bone broth here. This is 16 hours in! I let mine simmer for 30 hours total. 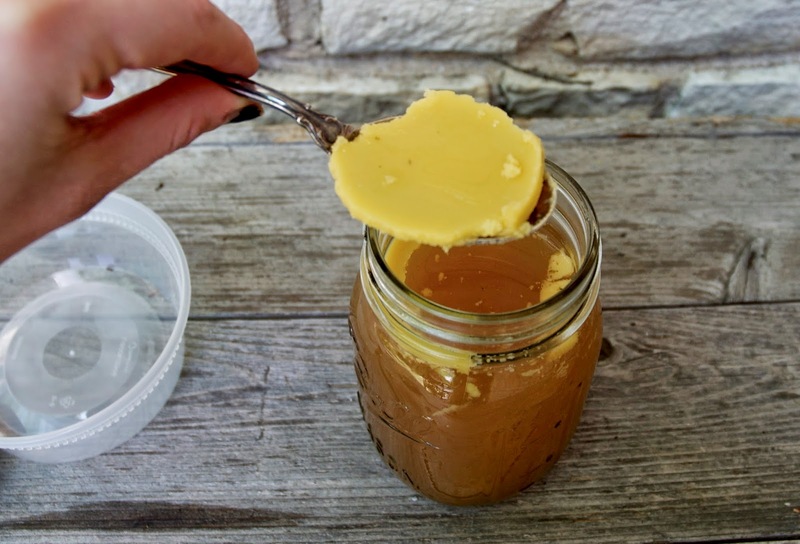 Save the removed fat in a separate container. This is a great to cook with! 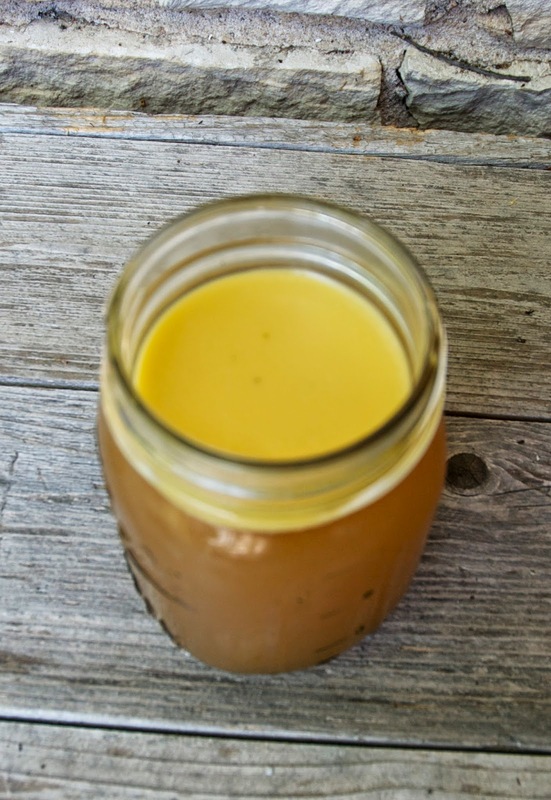 What can you do with bone broth? I use it for sauces, soups and crock pot meals. Tomorrow night, when I'm feeling better, I'll be making Pho, by simmering the broth with cinnamon sticks before using it to cook thinly-sliced ribeye garnished with sprouts, green onion, cilantro, mushrooms, thai chiles and ginger. Sounds good eh? I am excited! This stuff gets really jiggly in the fridge. It's like you can see its nutrient density. I'm so geeked out on paleo right now. Feel good song of the day: Anything by Phoebe Hunt. That's not a song. I literally mean anything. So sorry to hear you haven't been feeling well! 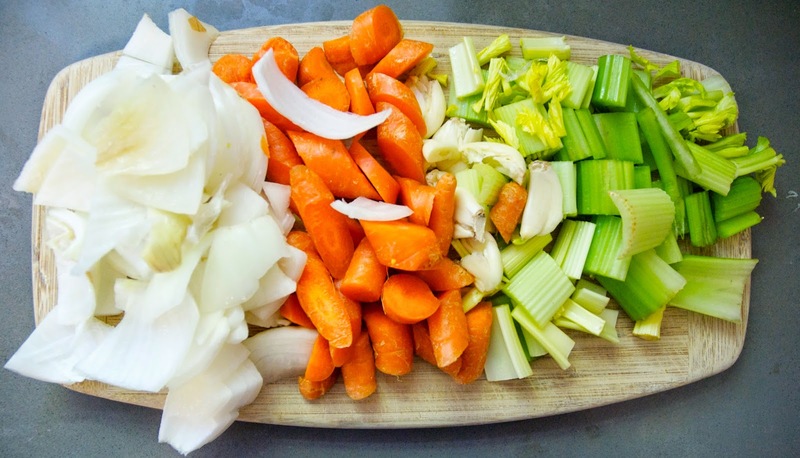 That bone broth recipe should help you heal and get back on track. Take care and get well soon!